In the chaotic universe, many intelligent species are on the brink of war, but the Guild holds the violence at bay to foster peaceful trade. The most renowned War Ender is Lady Alana of House Eyreid. Alana hopes to train her beloved nephew, Roark, in her vocation. It was supposed to be a simple training mission aboard an Interrealm slave ship. However, when Alana find her people enslaved, she murders the crew and rescues every slave—whether criminal, dishonored, or stolen. 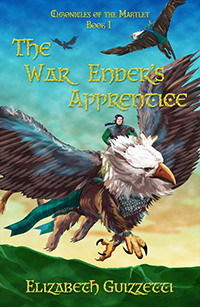 A fleeting vision of Roark's future tells her to offer the newly freed Eohan a War Ender’s education. For her vision to come true, Alana must rescue Eohan’s young brother who was sold in the last port and lost somewhere in the Realms, but first, they have a war to end. "Couldn’t put the book down until I finished it. I felt like my child self, hiding under my blanket with a flashlight..."
"Guizzetti's no nonsense writing packs many punches and combines intelligent themes. I'm hooked to see where the Chronicles of the Martlet series takes me. Fans of Terry Brooks and Dionne Lister will love this..."
Sitka’s Quay appears to be like every other coastal tourist town on Highway 101, but lurking below its southern grove of ancient spruce are three sleeping primordial gods. The Keeper, Dayla Fischer, must remain in control of her magical abilities or fall into sickening madness, but lives a relatively quiet life with her husband, Oliver. That is, until the delusional, but charming Jonah Leifson comes to town with a plan to awaken the Three. Soon, children begin disappearing. With powerful suggestion spells and mind reading abilities, Jonah wins over other sorcerers, meth users, the police, and eventually even her husband. Though no one believes her and she doubts her own sanity, she must stop Jonah, before he wakes the Three and brings about the end of the world. "Chaos, murder, sacrifice: it was a delicious read, and I devoured it all." "If you’re a fan of well-written, fast-paced, fantasy thrillers that trot into the neighborhood of horror, you’ll love it..."
"Guizzetti's delusional and magically gifted anti-hero is truly terrifying..."
In the once fertile Talamh, moans of hunger permeate the air. Her home in ruins, the young Lark crosses the world in search of her elder brother. She finds him enslaved to the mysterious Lord Malak. In exchange for Orin's freedom, Lark and her brother hunt down a perfect pearl known as the Carp's Eye. The adventure continues for Lark and Orin. As they storm a castle of the living statues, Orin must face who he is if he is going to become who he wants to be. As the famine spreads, many enact age-old sacrifical rites to bring forth rain. Lady Meadowlark and her Hunters Roan and Orin, share a dream of a prince’s death and venture forth to save him. Twin demons, Rosamundian and Tychobraticus, want to retire but hell has no retirement plan. So they dress up as poodles and move to Seattle where people will take care of them in their accustomed lifestyle. Yearly issues: 1, 2, 3, 4, 5 in circulation. Jack and Tom head north to the Klondike with dreams of easy money, instead they find back breaking work and a clan of man-eating sirens.